Monarch Air Group provides private air charter in Richmond, VA. Our clients benefit from top-notch service, unrelenting dedication to safety, wide selection of aircraft, and years of experience in chartering private jets. To obtain a free quote, please use our online quoting tool provided below, or call toll free 1-877-281-3051. Monarch Air Group offers private jet charter services to and from Richmond, VA, USA. 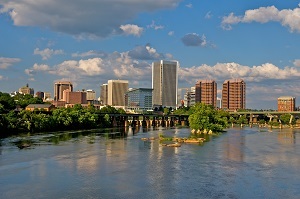 Located on the James River about 100 miles south of Washington D.C. Richmond is the capital of the Virginian state. Due to its central location Richmond is a perfect place for daytrips, historic and beaches sites, mountain visits. Nowadays Richmond is a prosperous city that offers a variety of business, educational cultural possibilities. The most popular tourist attractions are Richmond National Battlefield Park, the James River, St. John’s Church, Hollywood Cemetery, Monument Avenue and the Museum of the Confederacy. 1. APH, Camp A P Hill, Bowling Green, United States. 2. BKT, Blackstone AAF, Blackstone, United States. 3. CHO, Albemarle, Charlottesville, United States. 4. DGN, NAF, Dahlgren, United States. 5. FAF, Felker AAF, Fort Eustis, United States. 6. FKN, Municipal, Franklin, United States. 7. GVE, Municipal, Gordonsville, United States. 8. LFI, Langley AFB, Hampton, United States. 9. LOW, Louisa, Louisa, United States. 10. LVL, Lawrenceville, Lawrenceville, United States. 11. NYG, Quantico Nas, Quantico, United States. 12. PHF, Newport News/williamsb, Newport News, United States. 13. PTB, Municipal, Petersburg, United States. 14. RIC, Richmond International Airport, Richmond, VA, United States. 15. XSA, 1450 Aviation Rd, Tappahannock, VA 22560, United States. 16. XSM, St Marys, St Marys, United States. 1. The Jefferson Hotel, 101 West Franklin Street, Richmond. 2. The Jefferson Hotel, 101 West Franklin Street, Richmond. 3. Omni Richmond Hotel, 100 South 12th Street, Richmond. 4. Doubletree Hotel Richmond Downtown, 301 West Franklin Street, Richmond. 5. Commonwealth Park Suites Hotel, 901 Bank Street, Richmond. 6. Crowne Plaza Hotel Richmond Downtown, 555 East Canal Street, Richmond. 7. Holiday Inn Express, 201 East Cary Street, Richmond. 8. The Berkeley Hotel, 1200 East Cary Street, Richmond. 9. The Jefferson Hotel, 101 West Franklin Street, Richmond. 10. The Jefferson Hotel, 101 West Franklin Street, Richmond.